If you want to serve an elegant appetizer for your next dinner party, but would rather pick something simple to prepare, this recipe is just what you are looking for. All you need is a couple of endives, some smoked salmon (get the best quality you can afford), and a little Boursin cheese thinned with creme fraiche. Cut about 1/2 inch off the bottom of an endive spear. Start pulling off individual leaves. As you uncover leaves that are still attached at the base, cut another 1/2 inch off the bottom. Continue separating the endive leaves until you get to leaves that are too small. One endive will give you about 12 leaves large enough to serve in this type of appetizer. In a small bowl, mix the Boursin cheese with enough creme fraiche to give it a nice spreading consistency. Arrange the endive on a platter. Spread each leaf with about 1 teaspoon of the Boursin mixture. Top with a sliver of smoked salmon. Sprinkle all of the salmon and cheese topped endive with freshly ground, coarse black pepper, and a little dill. Comments: We loved this appetizer, it is luscious enough with the creamy cheese, but the use of endive instead of a cracker gives it a much lighter feel. Next time I will go one step further and add a couple of capers to each of the servings. Two endives were butchered to get enough leaves for the platter you see in the photo. You might do a lot better than me, but just in case, save yourself some trouble and bring an extra endive home. I made it 2 hours before serving and the leaves retained their texture reasonably well. I would not make it more than 3 hours before serving. I hope that next time you have a dinner party on the horizon, you’ll consider this recipe. So simple to put together, but it will impress your guests for sure. I’ve never tasted this elegant appetizer but always wanted to give it a try. This is so perfect. Love good smoked salmon!!! Endive are a clever base for this recipe. I love smoked salmon. 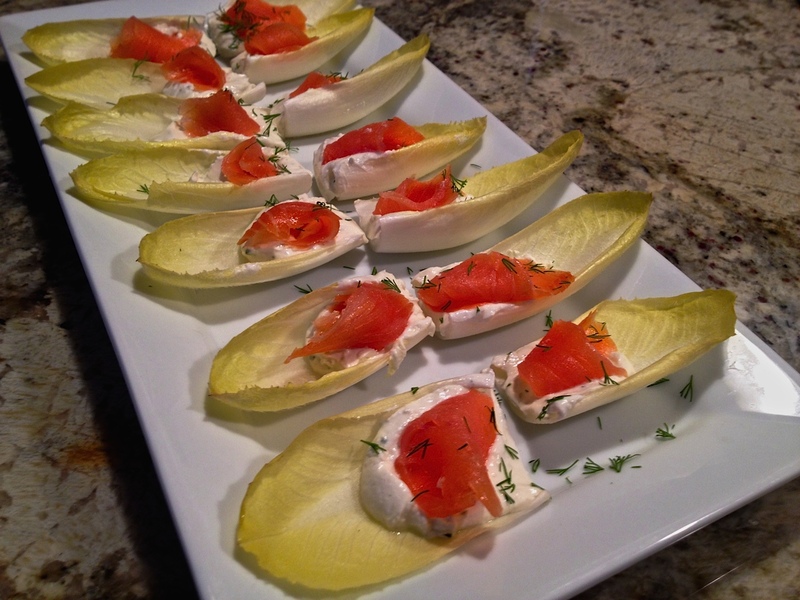 I had never used endive leaves, although they are pretty popular for this type of appetizer. I can see it as a base for many types of dips. Very impressive appetizer Sally, I’m sure this was a big hit. Yes, I think it was very well received. Definitely! I am sure your guests will love it, and it looks like something a lot more involved to prepare than it is… almost too simple! Looks perfect. I could eat that whole tray. Looks delicious Sally, nothing better than smoked salmon 🙂 I am sure your guest loved it! I love this idea — it’s so elegant, it makes me want to throw a party! Don’t you love when a recipe makes you want to party? I have nominated you for the Dragon’s Loyalty Award. Participation is optional, but if you wish to check it out, you find the rules here: http://tuscasblogg.wordpress.com/2014/04/15/dragons-loyalty-award/. Thanks for a nice and inspiring blog! For me, these awards are all about spreading “blog love”. They take a little time to conclude, but I like the idea! I’m such a sucker for smoked salmon and I love your capers suggestion! I might just make these as dinner! Capers and salmon, great together! give me some! I love smoked salmon and having it as an app is perfect! There’s something about the saltiness of the salmon that goes great with the cream cheese and of course, capers would not hurt! Sally… you must have read my mind 😉 — there’s just something about spring and smoked salmon and I’ve been craving it lately. Your appetizers are perfect. Simple, appealing and delicious. Ground black pepper…mmm… sometimes it’s the small pleasures that light you up ♡. I love appetizers like this — easy to put together, tasty and so pretty! Endive leaves are the perfect vehicle to carry a little smoked salmon! The thing I find too often with appetizers is that I want to eat the whole plate of them. 🙂 Appetizers can be meals… right?